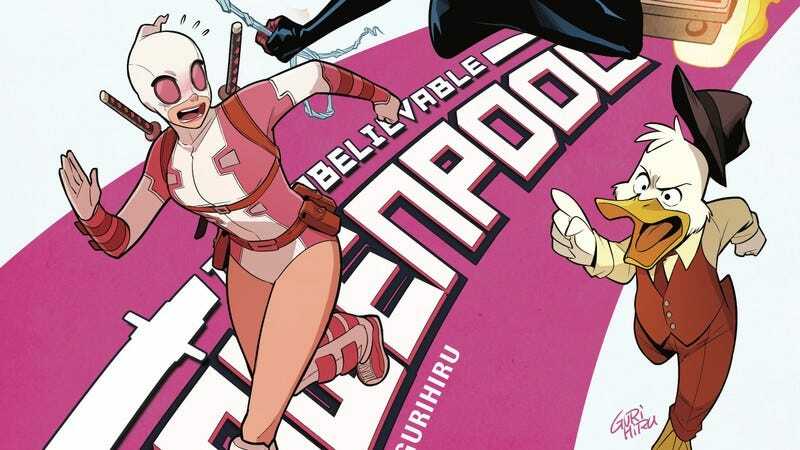 This exclusive preview of next week’s The Unbelievable Gwenpool #18 doesn’t feature the structural experimentation that has made this current arc so astonishing, instead jumping away from Gwen to show her brother Teddy’s experience in the Marvel Universe. Even though Teddy has been thrown into a confusing, scary situation, the creative team still finds way to bring humor to the story, primarily by having Gwen’s adorable octopus backpack represent her demise. As hard as Teddy tries, he just can’t pull the backpack out of the wall, and his increasingly devastated expression is met by the octopus’ blank stare. Gurihiru delivers rich emotion and clean, dynamic action, and the final panel promises a cavalcade of familiar superhero faces as Teddy Poole ventures deeper into the world of Marvel Comics.